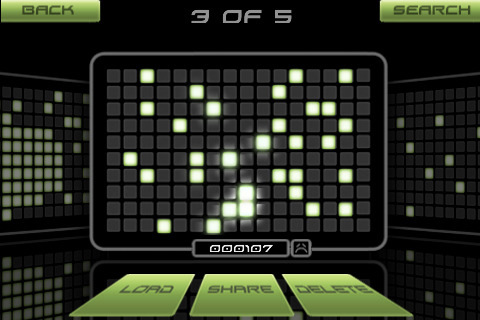 Tired of waiting for a proper tonematrix or tenori-on on the iPhone? The wait is over…the long waited and most hyped music app that lets anyone compose brilliant music compositions (even those who think that they aren’t musically talented) is now available! Melodica is a revolutionary music application that mixes lights and sounds in a unique way, allowing anyone to compose music intuitively creating amazing visual effects just with the tips of your fingers. With Melodica everyone can make music, and when we say everyone, we mean it! We believe that simplicity is beautiful, and you will too as soon as you start to play with Melodica! Choose from 4 distinct yet equally beautiful sound themes. Or make you own theme by customizing instrument, scale and tempo. Save your tunes and share them with the world! Or listen to other people’s tunes. Plug the headphones in to your device, choose sound theme and start touching the boxes – make music! Yes it is just that simple! Melodica comes from the makers of Fuzzle/Fling and it is inspired on the Tenori-on and on Tone Matrix made by Andre Michelle. Try the Melodica FREE version to really hear what Melodica is all about! – Customize instrument, scale and tempo – dozens of different sound setups! – Customize music instrument, scale and tempo – dozens of different sound setups!